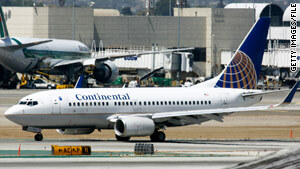 A Continental plane, similar to this one, was diverted to Jacksonville International Airport. A Homeland Security official says it was a case of "mistaken identity"
(CNN) -- Authorities diverted a Bogota, Colombia-bound Continental Airlines flight to Florida on Friday because of a "potential person of interest," although the passenger was later cleared, federal aviation authorities said. Continental Airlines Flight 881, which departed from New Jersey's Newark Liberty International Airport, landed at Florida's Jacksonville International Airport around 5:45 p.m., the Transportation Security Administration said. The FBI cleared the passenger, and the flight was continuing to Bogota, agency said. A Homeland Security official said it was a case of "mistaken identity" and that the FBI had to verify the identity of the passenger. The source asked not to be identified because the matter is under investigation. TSA is investigating why the carrier permitted someone who was a potential match to board the flight, the official said.